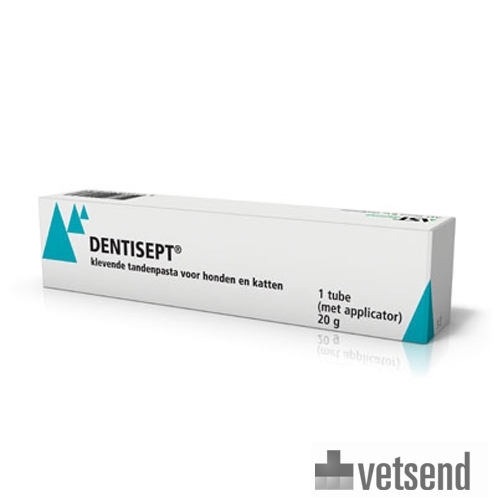 Dentisept toothpaste is a sticky toothpaste for cats and dogs. Dentisept can be used to maintain a normal, plaque-free environment in your pet's mouth. Dentisept may also help to restore sore gums and aid in the recovery from skin infections as a result of skin folds. Dentisept sticky toothpaste for cats and dogs. Dentisept is effective at maintaining a normal plaque-free environment in the mouth. It may also help to restore sore gums and aid in the recovery from skin infections as a result of skin folds. Chlorhexidine. Proportion of active and other ingredients: Active ingredient: 1 g paste contains 2 mg Chlorhexidine. Dentisept toothpast can be used to maintain a normal plaque-free environment in your pet's mouth. It can also aid in the recovery from gingivitis and skin fold dermatitis. Dentisept can be applied directly into the oral cavity using the enclosed applicator. The paste is distributed around the mouth by the dog or cat with its tongue. The best results are achieved when the paste is inserted into the mouth after feeding. Externally, the paste can also be gently applied to the skin with a clean finger. Dentisept can be used daily or weekly depending on the symptoms. Please read the leaflet before use. Store below 25ºC and do not freeze. For use in animals only. Keep out of the reach and sight of children. In rare cases, cats may have abnormally high saliva production. When Dentisept is used over a long period of time, there may be a brown discolouration on the teeth. This discolouration can be easily removed by your vet using an ultrasonic device. If you notice any serious effects or other effects not mentioned in this leaflet, please inform your veterinarian. Have you used Dentisept Toothpaste before? Let us know what you think about this product.